The Pinn departs Pinner town centre to the south, but the Celandine Route heads west. It has its reasons - there's barely anything to see down Marsh Lane, plus the river has to rebound before it bumps into its neighbour, the Yeading Brook. Instead the trail tracks through Pinner Memorial Park to West End Lane, the heart of a pre-Metro-land hamlet, before rejoining the Pinn by some allotments. You can take the council-approved route along a newly-made-up track, but it's much more fun to veer off into the woods (just past the dangling blue rope) to follow a teetering riverbank path. Please don't sue me if the edge crumbles and you fall in, and don't bother clambering over the fallen tree because the path ends shortly afterwards, but there is something 'proper' about taking the brinkmanship route. At the start of the next clearing the Pinn enters the borough of Hillingdon, where it'll remain for the rest of its course. The council have put up a very strange notice ahead, advising residents that the scattering of human ashes is not permitted because the minerals therein affect wildlife. Perhaps they've been stirred to action by the impromptu shrine to an E-taking schoolboy pinned to a tree ahead, or perhaps they're just a bunch of miserable jobsworths. Long Meadow is a relic from the hayfields that preceded residential development hereabouts, and there's another pub called The Case Is Altered through the trees. More significantly the grounds of former Eastcote House are accessible across the boardwalk, or would be if only they weren't fenced off for major renovation works at present. My visit to the dovecote and walled garden will have to wait for another day. 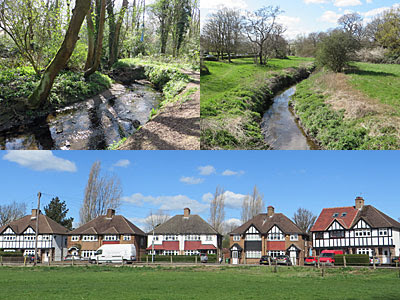 The riverbank leads eventually to Eastcote High Road, its shopping parade the last opportunity to stock up on provisions for half a dozen miles, before skipping off back between the houses. Large gabled semis make way for one of the largest green expanses along the walk, Kings College Playing Fields, with physical exertion opportunities ranging from badminton to skateboarding (or sitting around and smoking weed, if Saturday's teenagers are anything to go by). The area is overseen by the Friends of Pinn Meadows, an extremely keen local action group, whose conservation day with the Mayor of Hillingdon is commemorated in a newspaper front page pinned to a gate. A muddier stretch leads to a proper meadow, gloriously verdant in high summer, currently fresh-mown and heron-friendly. 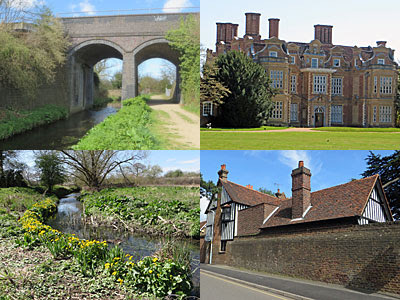 By now the walk's reached Ruislip, with historic Manor Farm House a short distance to the south and the Lido half a mile to the north. A thread of watery green passes between rows of back gardens, before the trail makes a rare visit to a residential street. Return requires ducking beneath a vehicle gate, confirming that the Celandine Route isn't pushchair friendly (and is positively wheelchair-unfriendly in places). The Pinn at this point marks the inner edge of the Green Belt - there are no suburbs further out, other than those planned and snuffed out in the 1930s. Through the trees is West Ruislip Golf Course, which leads round to the viaduct over which Chiltern Trains occasionally thunder (and through which HS2 would plough as it exited the capital). For now, most of the time, all is very quiet. Bending back south into civilisation, the meandering Pinn holds a secret. Pynchester Moat is a defensive Tudor structure located in a bend on the river, square in shape, now little more than a low earthwork overtaken by trees (and an explanatory display board). Ahead lies Swakeleys Park, a Green Flag recreational space, with the Pinn at its heart. The park was carved out of the estate of Swakeleys House, a grand Jacobean mansion built in 1623 for a former Lord Mayor of London. The multi-chimneyed house still stands behind a screening hedge, but requires major renovation, making it an ideal purchase for the overseas billionaire in need of a 23-bedroom London bolthole. Elsewhere in the park I spotted my first bluebells of the year, as well as a small weir over which the river tumbles - which I recorded. If you'd like to hear the Pinn drop, listen here. Now up to five metres wide, the Pinn disappears into thick woodland before dipping beneath the A40 Western Avenue. 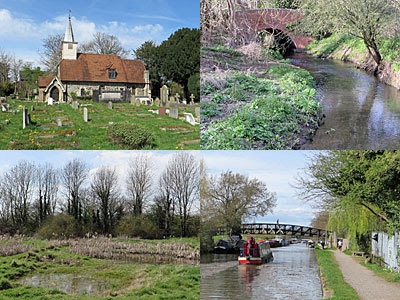 Following on foot requires a lengthy detour over a horseshoe footbridge, and then a descent of Uxbridge Common. This would be a lovely open space were it not for the traffic rushing by, although the Pinn attempts to add a dash of beauty, aided at present by a flourish of marsh marigolds on the first bend. Make the most of it too, because if you're following the official trail, this is the last you'll see of the Pinn for over an hour. From this point onwards the floodplain is generally inaccessible, or at least devoid of housing for fear of inundation. A hike across the common leads to a footbridge over the Metropolitan railway leads to an avenue of bungalows. What I'd recommend doing is venturing into the meadow behind Sweetcroft Lane for a secluded glimpse of the river, but the Celandine Route sticks to the road and invites you to turn off before you reach the bridge at the foot of the hill. The next half mile diversion is thanks to RAF Uxbridge, through whose grounds the Pinn ran before the base was decommissioned, its future now as landscaping for 1340 houses and community facilities. The subsequent half mile has been captured by Hillingdon Golf Club, a miserable bunch whose every gate and boundary fence warns of prosecution should you attempt to enter. Instead you'll be following Vine Lane, a narrow winding street that's one of Hillingdon's more aspirational addresses, to the heart of the medieval village, now unceremoniously dual-carriagewayed. The trail ignores the Pinn's progress beneath Stratford Bridge at the foot of Hillingdon Hill (no great loss), instead taking a shortcut down the edge of a cemetery. Ahead is the campus of Brunel University, a very shiny thing, and the third organisation hereabouts to capture the Pinn as its own. Shunned, the Celandine Route follows an arrow-straight lane along the southern perimeter, an unmetalled track providing access to the local allotments. At last the river reappears, emerging from between Brutalist towers, and promptly disappearing again into a barred meadow labelled "No Unauthorised Entry". What hazards Brunel students might have created in there I don't know, but by this point you'll likely be wishing you'd abandoned the walk two paragraphs ago. It's a relief to reach St Laurence's Church, Cowley's 12th century place of worship, and then Robbie Bell Bridge where the Pinn finally escapes captivity. This is Pield Heath, where a broad stream runs between some of the university's sports pitches, with one last dangling blue rope above the ripples for teenage summer entertainment. On my visit bees and butterflies added to the woodland pre-summer vibe, while a discarded trolley subtracted in equal measure. Only infrequently does the path across the common actually border the Pinn, so make the most, because there's no reason to get your camera out after this. Ahead is the suburb of Yiewsley, where this river terminates, annoyingly unseen. A wall of out-of-town stores almost completely blocks access to the Colne Valley, the trick being to duck through Tesco's backlot and find the towpath exit beneath the multi-storey car park. Meanwhile the Pinn arrives via the back of Currys/Argos, down a miserable concrete channel to a stagnant double pool. Georgian engineering carries the river underneath the Grand Union Canal - if you look across to the other bank you can see it emerge at a lower level. But its final metres play out on private land, behind a major modern canalside housing development, before merging with a thread of the River Colne. Pinn down.